The NY Times published a story, “In Graying Priesthood, New York’s Grayest Keeps Faith in Bronx,” on Monsignor Gerald Ryan, 92, pastor of Saint Luke’s Church (in the Mott Haven section of the Bronx, NYC). 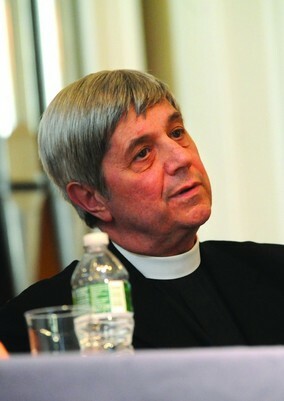 Monsignor’s the oldest serving Catholic priest serving the Church in New York. A terrific story on man who’s given his all for Christ and the Church. Read the story and be sure to view the pictures. Pray for Mary’s intercession for priests…. Being a Catholic Priest–and Married, salient reflections…. A dear friend of mine, Father Richard Cipolla published an article today in the Wall Street Journal on what it means for a faithful Christian to belong to Christ faithfully, moving from an Episcopal Church to full communion with the Catholic Church and being a married Catholic priest. The life of sacrifice and joy is clear in Cipolla’s story. For me, it is a testament of grace to know Father Richard and his wife, Cathy, and to have met his children. Wouldn’t be good if all the clergy could say that with conviction and love. Last week Father Richard celebrated his anniversary of ordination to the Catholic priesthood on January 28 in the Diocese of Bridgeport. Let us pray for him and Holy Mother Church. The pope has created a new diocese for bringing Episcopalians into the church. Last month, Pope Benedict announced the formation of an American “ordinariate,” or special diocese for Episcopal congregations that want to move to Roman Catholicism (driven largely by Episcopalianism’s liberal drift). These congregations, the pope ruled, could keep some of their Anglican liturgy. More significantly, a small but sizable number of married Episcopal priests will now become married Catholic priests. As a married Catholic priest ordained in 1984 under a special provision set forth by Pope John Paul II (for individual priests, judged on an individual basis), I have closely followed Pope Benedict’s announcement. I rejoice in this catholic and generous gesture by the pope and am overjoyed that these priests and their families will be welcomed into the Catholic Church. But that is not to say it won’t bring its own share of challenges. My experience as a married Catholic priest for 28 years brings to mind several thoughts, both practical and spiritual. First, the church must support new priests’ families financially. During my first years as a married Catholic priest, there were times when we could not pay the heating bill. When I was ordained, it was made quite clear to me that I should not look to the church as my main source of income but rather to a full-time job outside of the church. My parish duties have thus always been secondary.